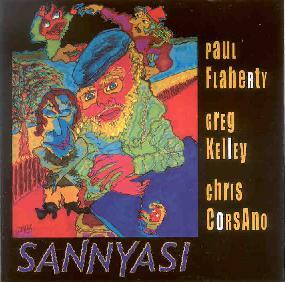 Paul Flaherty/Greg Kelley/Chris Corsano - "Sannyasi"
Free jazz like this really shares many similarites with extended jamming psychedelic music in a lot of ways. Both rose in the mid 60's in response to the limitations imposed by the traditional forms of music that existed at the time, and musically both focus on the instrumentalists playing off of one another, often starting out with a structure or rules on some level but which allow flexibility to explore and improvise in the moment as inspiration hits. Paul Flaherty has been exploring the limits of jazz for a long time through his collaborations with drummer Randall Colbourne (see any of their fine releases) and here steps out with Nmperign trumpet player Greg Kelley and drummer Chris Corsano, with whom he collaborated on last year's The Hated Music CD. Although definitely modern, the playing on this draws upon the elements of late 60's era free jazz, favoring a balance between melodic and the noise. Having heard the sparse and non-traditional approach of Kelley's trumpet work with Nmperign it was cool to hear him in this context, in which he is mixing it up and often blowing hard and free. Corsano's drumming is aggressive and excellent, and at times when they go into full attack mode, such as the awsome "Blood Roses" I was reminded fury of Peter Brotzmann's Die Like a Dog Quartet. Great stuff. For more information you can snail mail Web Paint Music at PO Box 1024; Manchester, CT 06045.